The Contender™ Post-Op Knee Brace features a simple adjustment system to minimize fit time after surgery, and at 27oz., it’s one of the lightest braces on the market. 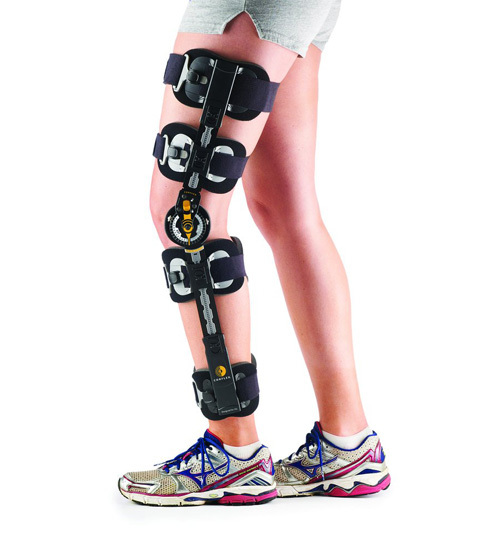 The X-Flex™ Cuff System flexes to hug the leg, significantly reducing brace migration. QuikZip™ Buckles allow for easy application and micro adjustment of the strap for a secure fit. The ZipTrak Telescoping System adjusts brace length from 18”-26” in 1/8” increments and also allows adjustment of intermediate cuffs to help avoid incision sites. The hinge features a six position drop lock that fixes the brace from -10° to 40° in 10° increments. A controlled range of motion is available from -10° to 110° and is easily set using flexion and extension finger touch buttons. Available in Lite or Full Foam versions the Contender Post-Op Knee Brace offers the latest in knee brace technology such as multi-telescoping cuffs, user-friendly buckles, and a critical suspension system. Indicated for range of motion control following ACL, PCL, MCL and LCL surgeries, meniscal repairs, patella realignment, regenerative chondroplasty, stable femoral fractures, total knee replacements, and tibial plateau fractures. Lightweight, custom-bendable, aircraft grade aluminum uprights are notched to assist in contouring; latex-free foam liner helps reduce brace migration.